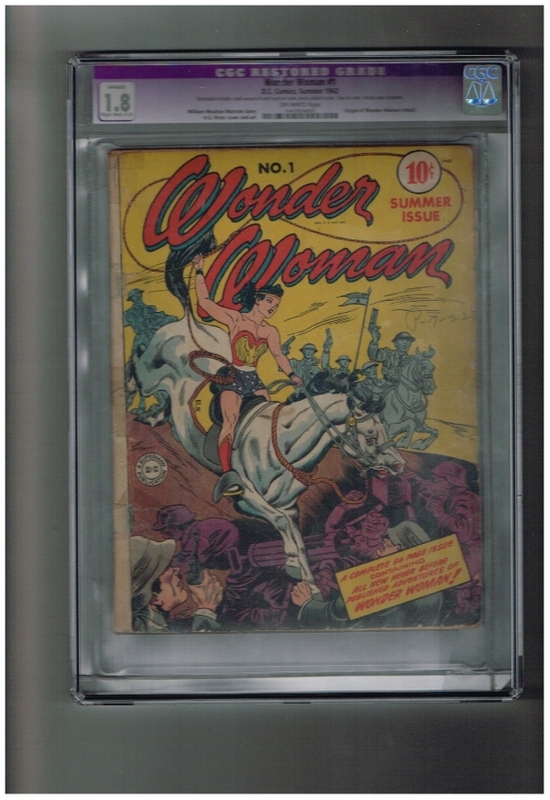 WONDER WOMAN (V1) #1 CGC Graded! Key Gold Age issue! Great find! Cover by Harry G. Peter. "Who Is She?" text story by William Moulton Marston, art by Harry G. Peter; The Gods behind the epithet, "Beautiful as Aphrodite, Wise as Athena, Strong as Hercules and Swift as Mercury", are visually and in text introduced to the reader. Untitled story, script by William Moulton Marston (as Charles Moulton), art by Harry G. Peter; Upon her arrival in man's world, Wonder Woman drops an Amazon scroll that details the origin and early days of the Amazons, while later sources outline her birth, her youth, and her battle in the arena for the right to be Wonder Woman. "Wonder Woman Goes To the Circus! ", script by William Moulton Marston (as Charles Moulton), art by Harry G. Peter; Wonder Woman brings children to King's Colossal Circus, performs in the big ring, and with the help of Etta and Steve, investigates a rash of elephant deaths by poisoning which threaten to close the circus. "Florence Nightingale: Angel of Crimea," script by Alice Marble, art by Sheldon Moldoff; a four-page Florence Nightingale bio. Untitled story, script by William Moulton Marston (as Charles Moulton), art by Harry G. Peter; Suspecting Paula von Gunther of leaking military secrets, Diana and Steve visit her in prison, where Paula is aided in her subterfuge when the magic lasso accidentally falls into her hands. "Songs Without Music" two-page story starring Sweet Adeline, script and art by Art Helfant. "The Greatest Feat of Daring In Human History! ", script by William Moulton Marston (as Charles Moulton), art by Harry G. Peter; When Etta's brother is attacked by spies, Wonder Woman and Etta trail them from Texas to Mexico City, where Wonder Woman fights a bullfight and stops a secret Japanese invasion of Mexico. 68 pgs. Tired of buying an item and when you receive it, it's not the same as what the photo in the auction showed (be it condition misrepresentation or anything else)? So are we! Since we value our customers so much, we NEVER use "stock photos". We take the time to photograph or scan each item ourselves so you can buy with confidence knowing that you will get the actual item shown! Yes, we do offer multiple purchase shipping discounts. Please refer to our store homepage for more information. It is against the law to falsify customs documents. All customs documents will be marked as "Merchandise" and will have the exact purchase price.